The Gospel of St. Luke today treats the parable of the Good Samaritan and the command of our Lord to go and do likewise in loving our neighbor for love of God. The Fathers and early Doctors of the Church all agree, this parable is an allegory of the New Covenant. The victim in saying help is Adam , his posterity is Jerusalem. The man, by heading for Jericho is seeking the world, the flesh and the devil, who is the person in the robbers, who will take care of him or her by succumbing to sin. Those who pass by him without helping are the old Law, while the Samaritan is Christ Who represents the New Law. His beast of burden means the Lord’s humanity and the innate compassion He brings the man to represent the only Church He founded. The wine for the man is the Blood of Christ, the oil is His mercy. Almighty and merciful God, by Whose grace Your faithful people serve You worthily and righteously, grant, we beseech You, that we may hasten without stumbling to those things You have promised us. Through Jesus Christ, thy Son our Lord, Who liveth and reigneth with thee, in the unity of the Holy Ghost, ever one God, world without end. R. Amen. Lesson from the Epistle of blessed Paul the Apostle to the Corinthians. Brothers: He that glorieth, let him glory in the Lord. For not he who commendeth himself, is approved, but he, whom God commendeth. Would to God you could bear with some little of my folly: but do bear with me. For I am jealous of you with the jealousy of God. For I have espoused you to one husband that I may present you as a chaste virgin to Christ. O Lord, we beseech You, graciously look upon the offerings which we lay upon Your sacred altar; so that they may bring us plentiful forgiveness while they give honor to Your name. The five wise virgines took oil in their vessels with the lamps. And at midnight there was a cry made: Behold the bridegroom cometh, go ye forth to meet him. May the holy reception of this sacrament, we beseech You, O Lord, restore us to life, and bestow upon us forgiveness and protection. Through Jesus Christ, thy Son our Lord, Who liveth and reigneth with thee, in the unity of the Holy Ghost, ever one God, world without end. R. Amen. At that time, Jesus said to His disciples: Blessed are the eyes that see what you see! For I say to you, many prophets and kings have desired to see what you see, and they have not seen it; and to hear what you hear, and they have not heard it. And behold, a certain lawyer got up to test Him, saying, Master, what must I do to gain eternal life? But He said to him, What is written in the Law? How do you read? He answered and said, You shall love the Lord your God with your whole heart, and with your whole soul, and with your whole strength, and with your whole mind; and your neighbor as yourself. And He said to him, You have answered rightly; do this and you shall live. But he, wishing to justify himself, said to Jesus, And who is my neighbor? Jesus answered and said, A certain man was going down from Jerusalem to Jericho, and he fell in with robbers, who after both stripping him and beating him went their way, leaving him half-dead. But, as it happened, a certain priest was going down the same way; and when he saw him, he passed by. And likewise a Levite also, when he was near the place and saw him, passed by. But a certain Samaritan as he journeyed came upon him, and seeing him, was moved with compassion. 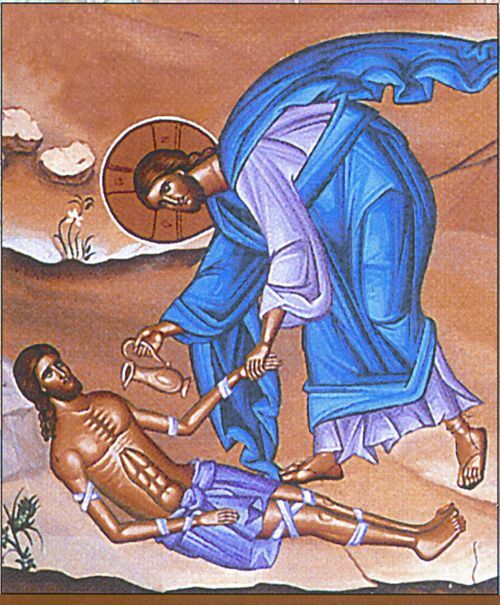 And he went up to him and bound up his wounds, pouring on oil and wine. And setting him on his own beast, he brought him to an inn and took care of him. And the next day he took out two denarii and gave them to the innkeeper and said, ‘Take care of him; and whatever more you spend, I, on my way back, will repay you.’ Which of these three, in your opinion, proved himself neighbor to him who fell among the robbers? And he said, He who took pity on him. And Jesus said to him, Go and do also in like manner. 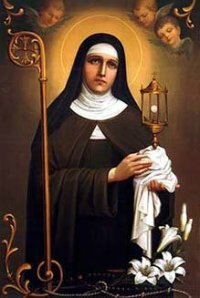 Day III in the Octave of St LaurenceGodHoly GhostIntroitJesuJesus ChristLawrenceLordMartyr; Commemoration of St ClareO Lordst clairst clarest clare of assisiVirgin: Missa "Conféssio et pulchritúde"